I was curious about how many purists there are out there who prefer to solve sudoku puzzles entirely by hand compared to those that use software to assist them. 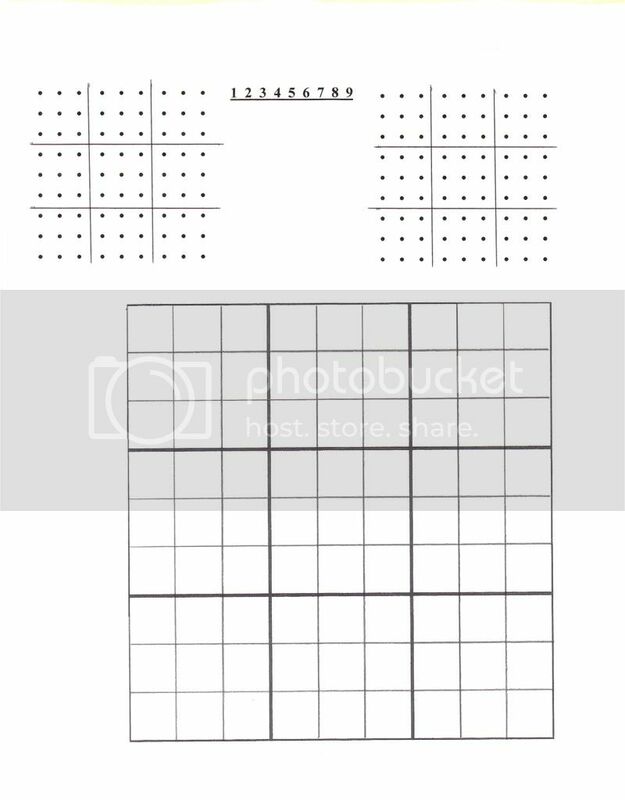 I used to write out a puzzle on a large grid, and figure out all the candidates in each square, and worked from there. Obviously, this is a painstaking process and errors can result. Then I tried out Simple Sudoku from someone's recommendation, and am able to solve much more difficult puzzles because it automatically fills out and removes candidates for me as I work on the puzzle. It can also highlight any given number that I choose, which allows for easier detection of various techniques to use, such as x-wing, swordfish, etc. As far as I can see, that looks to me just an aid to solve the puzzle. As a matter of fact, I also use Simple Sudoku, because it makes possible to copy/paste grids in/from this forum. However, in my way of thinking the hardest puzzles deserve some special treatment, and for these I like to do all by hand (even the grid). Its also my opinion that, by studing the cells one by one, deciding which are the possible candidates, you will acquire a knowledge about the puzzle that you don't get so easily by using a program. That's why I would recommed you to, at least from time to time, to solve a puzzle by hand. At leat that's what I do. Mooker wrote: Then I tried out Simple Sudoku from someone's recommendation, and am able to solve much more difficult puzzles because it automatically fills out and removes candidates for me as I work on the puzzle. You are not certainly able to solve harder puzzles just because of Simple Sudoku. If you enjoy solving more with the help of a program, then go ahead and do so. After all, this is just a game. But be aware that if you make solving unneccessarily easy for you, you'll soon get bored with these puzzles. Personally, if I want to actually solve a puzzle all the way, I do it by hand no matter of difficulty. But if I'm just looking for the 'one move' to crack a hard puzzle I often use SS, as I am then not interested in working out all those singles and other basic moves. Carcul wrote: You are not certainly able to solve harder puzzles just because of Simple Sudoku. I need to clarify, Carcul. What I meant is that with software like Simple Sudoku, I am more easily able to spot swordfish, jellyfish, simple coloring, etc. Re: Sudoku Aid or Cheating? mooker wrote: I was curious about how many purists there are out there who prefer to solve sudoku puzzles entirely by hand compared to those that use software to assist them. I used to write out a puzzle on a large grid, and figure out all the candidates in each square, and worked from there. Obviously, this is a painstaking process and errors can result. I don't consider it cheating. However, take a very simple puzzle, put it in most computer solvers, it will be solved. Not every human will correctly solve that puzzle, even if there were 80 givens. I always solve on paper, I sometimes make a horrible mess. Be human, is my thought. Programming one's solver/helper is a fun activity in it's own right. training myself with how I Should Have found that move. It's all a fun learning process; no need to label these activities as "cheating"
Plattso wrote: I enjoy solving with pen and paper, and when I get stuck, I might load'er up in my solver and find the breakout move. Then I criticize my paper game, training myself with how I Should Have found that move. Great point. Right now I am reading through Andrew's Logic of Sudoku book and am learning techniques, as well as how to "see" them. Simple Sudoku is invaluable for this for me. Once I am better at seeing them, I will more than likely go back to pencil and paper. I have seen on the internet a wooden sudoku board with wooden tiles and candidates. Looked like a neat way to work on a board and not have the messiness of pencil erase marks or crossed-out candidates. I'm just worried that my cats would get up on the table and mess up the board that I spent so much time working on! For your information, you can use Simple Sudoku without it showing the candidates. Just go to the menu "Options" and uncheck the "Show Candidates" (Ctrl-W). Then it'd be almost the same as working with pen & paper (a minor difference is the computer will stop you from doing really stupid things such as putting two 1s on the same row). udosuk wrote: For your information, you can use Simple Sudoku without it showing the candidates. Just go to the menu "Options" and uncheck the "Show Candidates" (Ctrl-W). Then it'd be almost the same as working with pen & paper (a minor difference is the computer will stop you from doing really stupid things such as putting two 1s on the same row). In that case I suggest you to use a spreadsheet. I'm interested in finding out exactly how paper solvers set up their puzzles. I transfer my puzzles to a large grid (old eyes....) For pencilmarks I actually write the number of the candidate rather than using a dot. Do you have any individual way/tricks in setting up the puzzle that helps with solving? For example, I have a grid of dots on top of my page. I use the grid to sort individual values by lightly circling the dots. It's great for fish, hinges, etc. I connect strong links sometimes to reveal chains. I circle the dots on the other grid to keep track of on which cells I've run certain techniques, like AIC's, coloring, etc. I also use Simple Sudoku and I think it's a great piece of software. I would never have the patience of putting all the candidates in each respective box. As far as I am concerned using a program like Simple Sudoku is just a good way of ending the drudgery part of solving Sudoku puzzles. I have learned a great deal about solving Sudoku over the past two years and am now able to solve a very high percentage of all puzzles with the exception of the Tarek 6000 Pearly puzzles. I've tried solving these but cannot get anywhere because they don't even give you a lone number or two to start with. I do something else with using the Simple Sudoku program. I set it up to notify me when I make a wrong choice either of a placement or an elimination. As soon as the notification shows up at the bottom of of the grid, I stop and consider the puzzle unsolved. This is because I would solve 100% of the puzzles if I used these notifications to my advantage. Now, that would be cheating and I do not do it because I would only be kidding myself. On the other hand, I could turn off this error notification feature, but then I might make a mistake, and it would take me too much time to unravel the whole thing or start over again. It's just a way of making me enjoy solving these puzzles more. Wow!! 6.5-year-old thread! But since the topic is likely to still be of interest. . .
To me, using software to actually solve the puzzle feels like cheating, but I don't expect anyone else to hold to that same standard. At the start it's best not to use a computer at all while the rudiments are being learnt. However once things like hidden and naked singles and tuples are mastered, it becomes a bore going through a grid manually looking for them, before you can get your teeth into the more advanced methods. For this reason I have my own spreadsheet "Sudoku Drudge" which looks after chores that I now consider to be housekeeping such as updating the pencil marks when a placement has been made. Once this is done it then alerts me to the very basic eliminations that result which I can automatically action en-bloc or manually pick off the ones I consider most significant in the search of a short solution path. As I learnt new techniques I then added various colouring scheme options to help me pick out patterns or track inference chains, but all the eliminations I find this way are performed manually. I feel if I hadn't done this, I would never have got to exploring the more advanced solving methods as it would simply be too tedious doing all the ground work involved first. So yes, I'm cheating, but I feel my spreadsheet doesn't do anything that I couldn't do myself if my boredom threshold wasn't so low. It's by doing this, and maintaining a tight discipline regarding using logic rather than brute force, that I've managed to maintain my interest in Sudoku over several years.